Before John Landis would become a legendary comedic filmmaker--with movies like Kentucky Fried Movie, The Blues Brother, Trading Places and Coming to America--he was a young go-getter, and his drive and ambition eventually led him to make his first feature film. A wacky gorilla movie, Schlock is a homebrew film made with borrowed money and the help of friends, and its origins are obvious when you watch it. At the same time, there's no denying Landis' abilities--however raw--on several fronts, and the movie is not a chore to watch, amusing at points and full of charm. 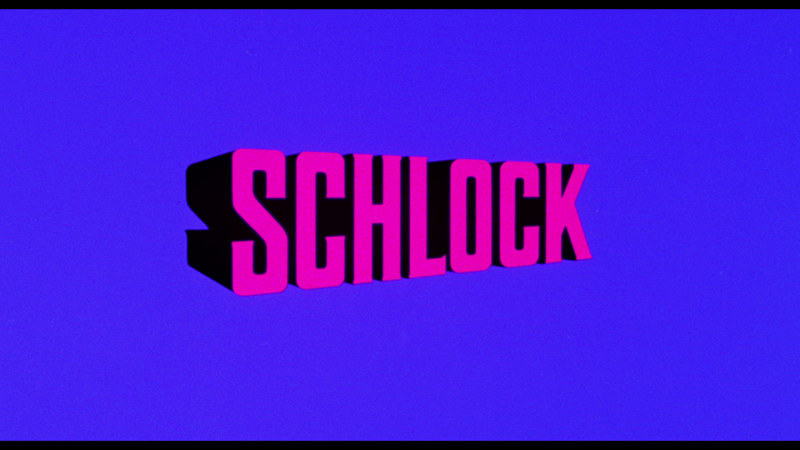 Schlock starts off in surprising manner, twice. First it kicks off with an odd, bombastic promotional segment for the film to follow, utilizing old stock footage, so you immediately know what you're getting yourself in for. But then there's a long, quiet scene of the results of some sort of carnage, which is so remarkably different in tone that you can't be sure what's happening. Apparently something has gone on a rampage, killing hundreds of people. But then, the tables are turned around again, and it's clear this is a comedy, as we watch what happens when a savage gorilla gets loose in suburbia, and has to confront the many minor hardships people face each day. As this goes on, we get to know Mindy, a blind girl about to regain her vision through a miraculous surgery. Having accidentally befriended the primate while unable to see, she finds herself the subject of his unwanted attention, setting up a Fay Wray/King Kong dynamic that the movie more than willingly leans into. But mostly it's just a day in the life, as Schlock wanders around town, interacting with various people and situations, whether it's precocious kids, tall theatergoers, or potential date rapists. Despite his murderous inclinations, Schlock seems to be something of a force for good, or at least not evil. Plenty of the tone and structure that makes Kentucky Fried Movie such an utterly entertaining movie is on display here--at least in some embryonic way. Little gags and bits, like a secretary getting into an argument with her boss over a simple message, are fun to see, as are the goofier elements, like a local news reporter oblivious to the atual news or a silly beat cop. 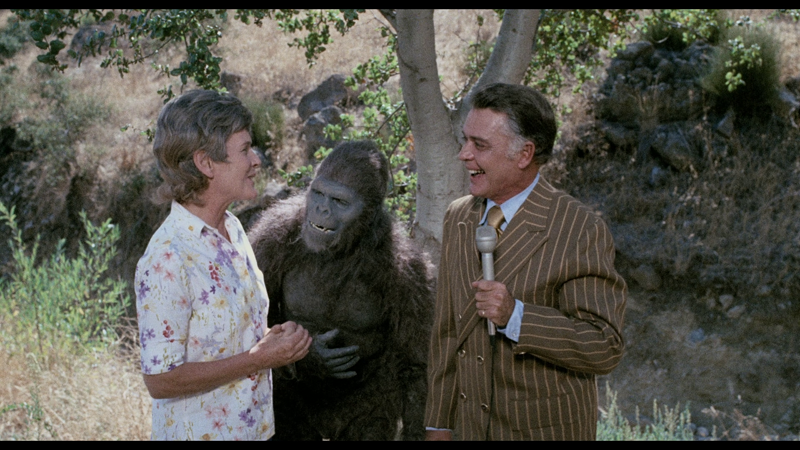 Landis not only wrote and directed, but he also plays the gorilla, under effects work by legendary monster maker Rick Baker (in his first credited film). Though obviously done for cost and availability purposes, Landis playing as Sclock is a natural performer, with solid comic timing. He's no Andy Serkis, but one look at his costume will tell you authenticity wasn't a goal. In fact, goals don't seem like part of the plan with Schlock, a loose assortment of segments that doesn't really go anywhere. It's just a good time, and a look at a great director's humble origins. We received a pre-production copy of the Blu-ray, so we can't provide details on the packaging, but the disc sports that oh so clean Arrow Video menu, offering the choices to watch the film, check out the bonus features and adjust the set-up. There are no audio options, but subtitles are available in English. Note: This review is based on a pre-production disc. The review will be updated if we receive a retail copy. The 1080p, AVC-encoded transfer on this Blu-ray is the end result of a 4K restoration of the original camera negative. Considering the film's age, low profile and incredibly low budget, that it looks as good as it does has to be considered a success. There's a heavy, but consistent grain to the image that will be distracting if you're close to a large display, but the image is clear and full of detail (especially in the hair, clothes and that gorilla suit.) Color is good but inconsistent, which looks to be an issue with the production, as light has a big effect on this. Noise isn't an issue, as the night scenes are quite clean, and exhibit solid black levels. The only negatives are the minor, yet frequent bits of dirt and damage. From a distance it's fine, but they are there. Presented with an LPCM 1.0 track, keeping faithful means keeping simple. There's nothing about the audio to this film that will jump out at you, but at the same time there's nothing that will be problem. Dialogue is clean and easy to comprehend (even if it has the tell-tale signs of an "amateur" recording effort), music is effective (including the somewhat eye-roll inducing use of "Thus Spoke Zarathustra") and sound effects get the job done. The mix is appropriately prioritized and has the right power for an easy listen. The main extra is an audio commentary with Landis and Baker, which is carried over from Anchor Bay's 2001 DVD. The long-time friends and collaborators reminisce about the production, sharing details and stories from the set with a very self-deprecating sense of humor, and tell the story of how they came to work together. It's a fun, informative track--just what you'd expect with Landis involved. There's more from Landis in "Birth of a Schlock", 41:27 from a German interview with the filmmaker from 2017. He covers some of the same info shared in the commentary, but goes in depth on his personal journey as a filmmaker from his earliest interest in the art, and also talks about his involvement with the Zucker Brothers. Landis again brings great energy to the piece, and is naturally the best expert on his career. We also get to hear from another person on the set, as "I Shot Schlock!" (7:34)--an archival featurette--gives the late cinematographer Bob Collins a chance to share his memories of the film's creation, including how he got on-board, his kids' involvement, his role as an actor and what it was like working with Landis. For an outsider's perspective, the 17:51 "Schlock Defrosted" presents author and critic Kim Newman in a new featurette where he discusses details of the film, places Schlock! in the context of the era's filmmaking and offers a critical analysis of the movie. Newman is obviously well-versed on films like Schlock and does a great job of breaking it down. Wrapping up the extras are a set of promotional materials, including a trio of theatrical trailers (1:34, 1:38, & 1:31), which are all very similar, with slight differences, including references to Landis' Animal House success and a completely different name. There's also four radio spots (2:19), three of which are variations on the theatrical trailer, and one with a weird conversation between a father and son. Schlock is not a great movie--it meanders its way through a relatively brief runtime, features mostly subpar acting and doesn't have the most original storyline in the history of film. But it is the first feature film from John Landis, and in addition to being an opportunity to see where he started out--not to mention Rick Baker--it also has plenty of the touches that would become his filmmaking style, albeit in a rougher, but still often funny form. Arrow has delivered the film in (at least in pre-production form) fine, if not pristine shape, and added a quality collection of new, newer and archival bonus content. If you approach the film in the right mindset, you can definitely enjoy Schlock, but expectations must be kept in check.